How do I enroll in Burnett County 4-H? Enrolling in 4-H is easy! All you have to do is find a local 4-H club you are interested in joining and start attending their meetings. Burnett County has four 4-H clubs located in Grantsburg, Siren and Webster. After finding a club you are interested in joining you can fill out an enrollment form at wi.4honline.com to become an official member of that club! Enrollment instructions are on the first page of 4honline.com. The same instructions are here: Re-Enroll Members/Leaders and Enrolling in 4HOnline as a NEW family. To find a 4-H Club near you in Burnett County, refer to the Community Clubs page on this website. Q: Why do kids like 4-H? A: They have fun with friends at meetings, social activities, camps, fairs, and on tours and trips. They learn to do interesting things, such as take care of animals and plants, fix their bikes, take pictures, practice cooking, and collect rocks. Also, they help others to learn more about their 4-H project; provide leadership to younger kids; and learn more about themselves. Q: Who can join 4-H? A: 4-H is open to any youth within the grades of K-13 (one year out of high school). Q: What do the “H’s” stand for? A: The four “H’s” stand for “Head, Heart, Hands, and Health.” And here is the 4-H pledge: I pledge…My head to clearer thinking…My heart to greater loyalty…My hands to larger service…My health to better living…For my club, my community, my country and my world. Q: How is 4-H different from other youth clubs and organizations, like scouts? A: 4-H is unique for many reasons. Both boys and girls can join 4-H, and you can join anytime from Kindergarten through your first year in college! Another great thing about 4-H is you decide what you want to do. 4-H is youth directed, meaning that kids can choose what projects and areas they want to be involved in. (For example, not everyone in 4-H has to be in the Dog Project. If you don’t like animals, or don’t have a dog you can choose something else you like…like Rocketry!) In 4-H the opportunities really are endless. Q: Do I have to join a 4-H Club? Or can I just join Burnett County 4-H? A: Anyone interested in joining 4-H should join a local club. 4-H Clubs are a great way for youth to feel like they belong to a group. Along with participating in county 4-H events, 4-H clubs do their own events and activities just for club members! Your local 4-H clubs are also great resources for 4-H members. There are many other adults and youth that serve as resources for other members. 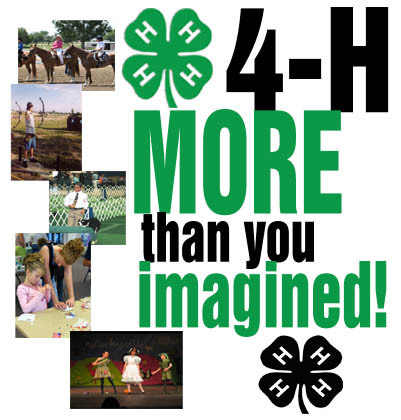 So overall, it really is a benefit to you to join a local club to become involved in 4-H! Q: Who names a club? A: Club members name their club, with guidance from their leader and 4-H youth development agent. Q: Who provides leadership for 4-H? A: 4-H is sponsored in Wisconsin by the Cooperative Extension Service of University of Wisconsin-Extension. Nationally, it is a part of the U.S. Department of Agriculture. Local leadership is provided by 4-H youth development agents in the county offices of the Cooperative Extension Service. Q: When did 4-H start in Wisconsin? A: 4-H began in the United States with corn and canning clubs in the early 1900’s (1902). These clubs were started by public school educators. The beginning of what became 4-H in Wisconsin was initiated in 1903 when Ransom Asa Moore had the idea to get youth involved in teaching their parents about farming advances. By 1910 this movement has become so sucessful that he was able to hire an assistant, Thomas Bewick, who later became the first State 4-H Leader in Wisconsin. 4-H formally originated with the Smith-Lever Act in 1914 which established the Cooperative Extension Service.